I was visiting my hometown of Louisville, KY. in late October and read the National FFA Agricultural Sales Career Development Event (CDE) would be hosted there, joined by a Yelm-participating FFA team. “The National FFA Agricultural Sales CDE is a competitive event that allows students to apply classroom knowledge to real-life situations. The event includes actual sales presentations, a written exam, team sales situation, an individual practical situation focusing on customer relations, customer service, or prospecting for customers. Each team competed at local and state levels for the privilege of representing their state at the National FFA Convention & Expo. CONGRATULATIONS to Jared Braswell, Jacob Guirell, Rebecca Foote, and Hannah McLaughlin! South Puget Sound Habitat for Humanity Executive Director Curt Andino & Community Partnership Supervisor Addie Candib accept O’Bee Credit Union’s check, along with invited supporters. South Puget Sound Habitat for Humanity Staff and guests met at the Yelm Habitat Store on Wednesday, November 27th to accept sponsorship funding from the recently-opened O Bee Credit Union branch in Yelm. O Bee has been an important supporter of Habitat and underscored their commitment by presenting a $5,000 check to Yelm’s Habitat. O Bee opened a branch in Yelm last month. Addie Candib, Community Partnership Supervisor for the Olympia-based South Puget Sound Habitat for Humanity was present along with Executive Director Curt Andino plus invited supporters to receive the check, covered by Nisqually Valley News Publisher/Editor Michael Wagar for next week’s newspaper. This was a terrific opportunity to showcase the Yelm Habitat for Humanity location with Store Manager Robert Chamberlain and his staff. South Puget Sound Habitat for Humanity is looking for qualified applicants to participate in its homeownership program. – Habitat homes are affordable. We use volunteers to build safe and decent homes. – It’s a hand up, not a hand out. Habitat homeowners are our partners. – You own your home. You purchase your home from Habitat for Humanity. – You help build your home. You get to learn how your home is built so you are prepared to maintain it. – Habitat finances homeownership. We offer zero interest loans to qualified applicants to purchase Habitat homes. Our average monthly mortgage payment is about $750. Are you eligible? Do you qualify? Happy Thanksgiving Day to you & yours! We have so much in our midst for which to be thankful. HAPPY THANKSGIVING 2013 TO YELM COMMUNITY BLOG READERS ! “Each year at this time school children all over America are taught the official Thanksgiving story, and newspapers, radio, TV, and magazines devote vast amounts of time and space to it. It is all very colorful and fascinating. Posted by Steve at 12:03 am | Permalink | Comments Off on Happy Thanksgiving Day to you & yours! The number of meals gifted to our local families has sharply increased this year in Yelm, closing in on 1,000 families being served. Consider the average sized family has at least 4 persons, which thus indicates close to 4,000 people will be served this Thanksgiving that need a helping hand in our area. The out-pouring of support for our friends, neighbors and fellow area residents has been heart-warming, yet to know such a large cross-section of people here need our help in their struggles is disconcerting. “[Todd] Skinner, who owns The Bunkhouse and Big Daddys On the Green, both in Yelm, partnered with Gods Portion for Thanksgiving last year to combine their services for one big Thanksgiving meal open to anyone and everyone. Skinner provided the location and cooking talent, while Gods Portion provided most of the food. Skinner says they will serve over 500 meals this Thanksgiving. “The Yelm Food Co-op calls all community businesses to join in the fourth annual Gift of Gobble. Read more from the Nisqually Valley News. Read more from Brittany Whitehead inthe Nisqually Valley News. Yelm Chamber announces 2013 Award winners! Posted by Steve at 11:53 am | Permalink | Comments Off on Yelm Chamber announces 2013 Award winners! “A bright light in the regional economic recovery is shining as years of planning, perseverance and investment by the Nisqually Tribe are coming into fruition. Read more from the SQUALLI ABSCH NEWS, the Nisqually Tribal News Letter. The newly elected Auditor, Mary Hall will take office immediately after certification of the November 5, 2013 General Election on November 26. The public is invited to the swearing in ceremony for her short term oath of office. The Swearing In Ceremony will be held on November 26 at 4:45p.m. at the Thurston County Superior Court Room 102 , 2000 Lakeridge Dr SW, Olympia WA. From the current Thurston County Auditor’s Office Press Release. Puyallup resident Ron Bestrom’s photo, July 24, 2012. 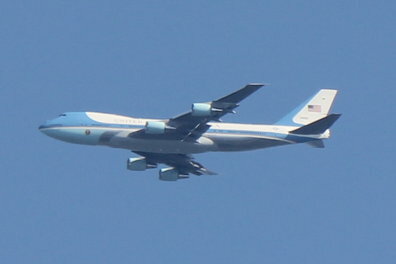 In case you missed the stunning sight of Air Force One over our area July 24, 2012, you will have another excellent chance to view the 747 arriving in Puget Sound this afternoon with partly cloudy skies forecast and an even better potential view tomorrow as President Obama flies from Sea-Tac Airport to San Francisco in the morning, if the marine deck clears (take-off 8:50am, look in sky approx. 9:05am). Read more from KING-5 TV News. Todd Skinner, former Air Force cook and owner of The Bunkhouse in Yelm has opened a second restaurant, Big Daddy’s on the Green at the Tahoma Valley Golf Course in Yelm, which opened for business Sept. 25. There was an official ribbon cutting on Friday, November 8, 2013 conducted by the Yelm Chamber of Commerce. Read more for location info. Best wishes to Todd in his new endeavor! MAKING SPIRITS BRIGHT…AND WARM This season the City of Yelm will be collecting donations of children’s HATS, MITTENS, GLOVES AND SCARVES for local families. Donations can be dropped in boxes located at City Hall or the Public Safety Building. Donations will be distributed by Yelm Community Services. Thank you, Happy Holidays.